Fortunately – for historians – several post-war Prime Ministers have been ‘scribblers’ in their official capacity, and their handiwork in the Prime Minister’s Office (PREM) files held at The National Archives, can make for fascinating reading. Comments written in the Prime Minister’s own hand (‘marginalia’) can be very revealing about the personality and guiding principles and values of a PM. Consider the following example from Margaret Thatcher’s first premiership. 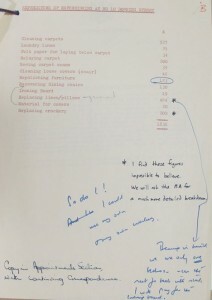 In a file concerning expenditure on government accommodation (PREM 19/474 ), we learn that, in June 1979, following a Parliamentary written question about the costs of refurbishing accommodation for ministers, the Department of the Environment published a breakdown of spend for each of the government departments without consulting the Prime Minister’s office. 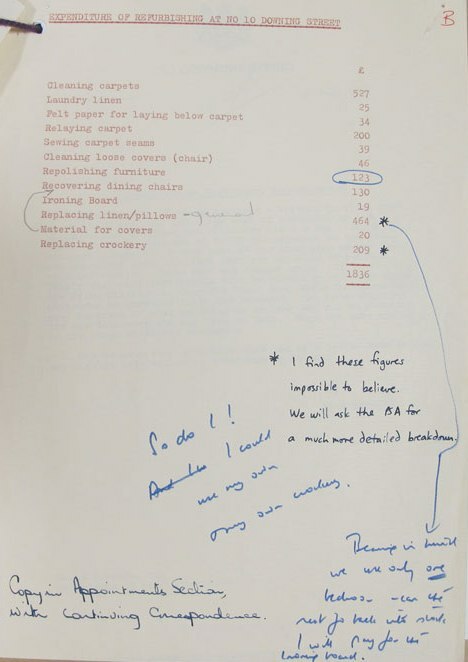 An official in Thatcher’s office appears sceptical of the alleged costs for refurbishing Number 10, stating ‘I find these figures impossible to believe’. Thatcher voices her agreement writing 'So do I!'. Referring to the flat at No.10, the cost for bedding is queried with Thatcher noting “we use only one bedroom”, and that she can use her own crockery and the price of an ironing board prompts her to state, more than once, “I will pay for the ironing board”. PREM 19/474 - "I will pay for the ironing board"
It’s an amusing example (on its release the press dubbed Margaret Thatcher the ‘Ironing Lady’), but it’s also a powerful illustration of Mrs Thatcher’s values, which are rooted in her strict upbringing - an emphasis on personal responsibility, thrift, self-reliance, and an instinctive antipathy towards unnecessary expenditure of tax-payers money – and this approach did not stop at home – it was an essential part of her government’s strategy in the early 1980s. More hard evidence of the ‘Thatcherite’ approach can be found in PREM 19/5, a file entitled ‘Freeze on Civil Service manpower; action to reduce Civil Service numbers and staff costs’. 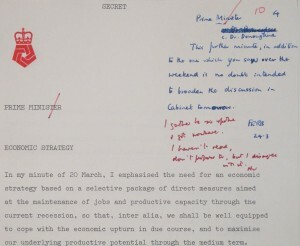 On a draft paper for Cabinet, by the Lord President, Christopher Soames, we see comments by Mrs Thatcher written in the margins made by her own hand. 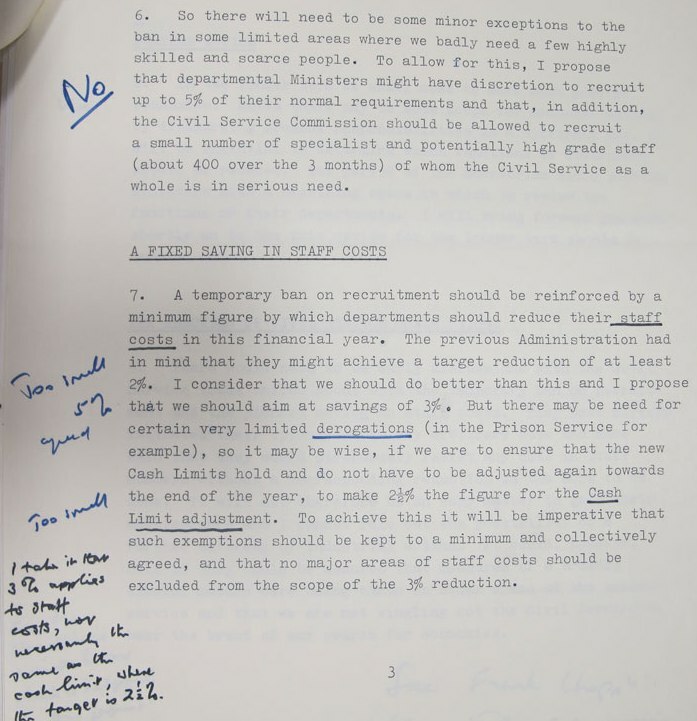 These comments are very direct – when Lord Soames suggested ‘some minor exceptions to the ban’ [on recruitment], Mrs Thatcher simply and emphatically, using her blue felt tip pen, wrote ‘No’. When he suggests a reduction of Civil Service staff cost of 3%, Mrs Thatcher wrote ‘Too small’, and gave her preferred figure of 5%. We can also see, from studying the documents, that Mrs Thatcher frequently underlined particular sentences or phrases which she found significant in memos - evidence of intense concentration on the details of the subject in hand. 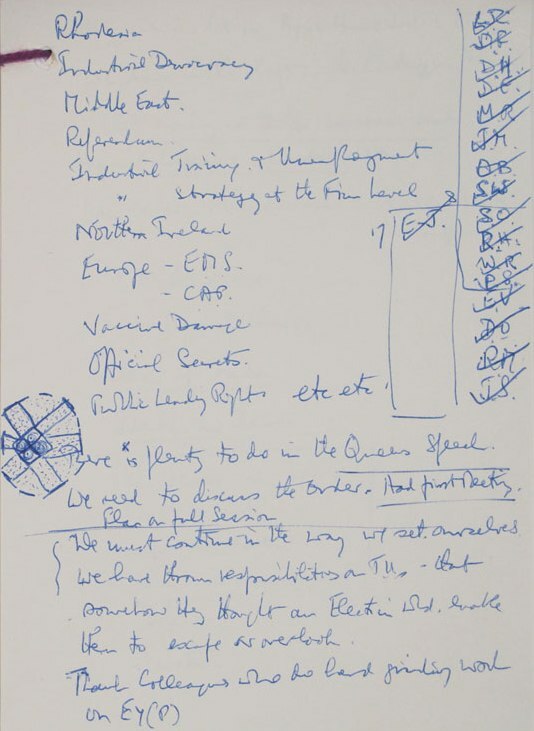 Lady Thatcher’s personal papers, held by the Churchill Archives Centre, many of which are available online at the Margaret Thatcher Foundation website are also rich in marginalia. The next example shows the huge pressures to which Prime Ministers are subjected – it’s from a file entitled ‘Forward Look’ (PREM 16/1667). In the autumn of 1978, the Labour Government were exploring key policy areas for the term ahead (James Callaghan had decided against an October general election). 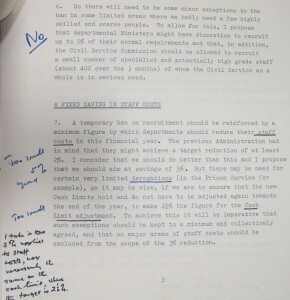 The file contains 23 pages of handwritten notes made by Callaghan during a meeting on future policy initiatives on 19 September 1978. The notes reflect a virtual ‘A-Z’ of government activity: devolution, educational standards, fuel costs, immigration, inner cities, law and order, pollution, public expenditure, unemployment, technological change...the list goes on and on. It is almost breathtaking in its scope – the longest ‘to do’ list ever? 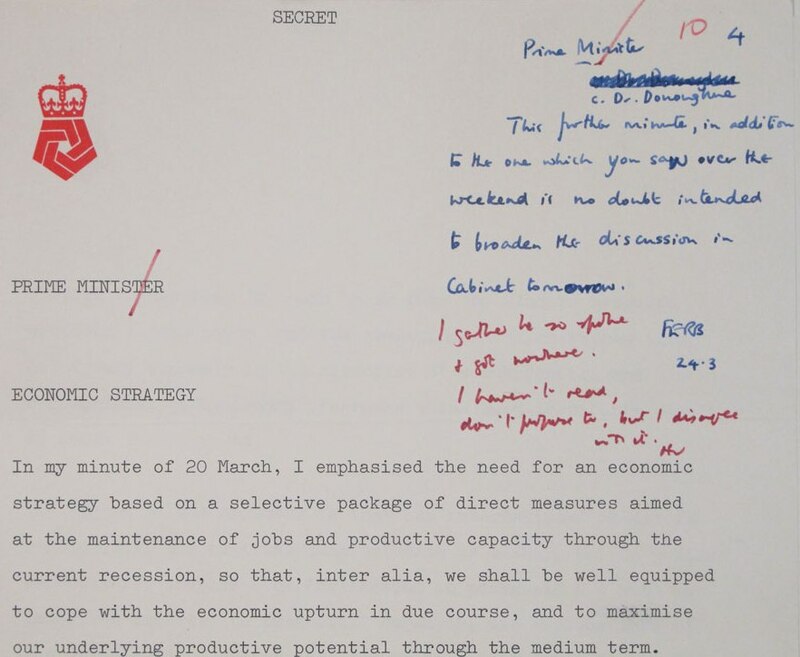 The Prime Ministers’ marginalia can include comments of astounding frankness concerning papers produced by ministerial colleagues. Prime Ministers could afford to reveal their true feelings when commenting on such papers as they were aware that they would not see the light of day for 30 years, and that they could rely on their private secretaries to convey their opinions and decisions in a polite fashion. In 1975 all the economic indicators were pointing the wrong way. The government was wrestling with rampant inflation, unemployment, and a balance of payments deficit. Chancellor Denis Healey’s strategy was to trim public expenditure and to keep wage increases in line with prices. 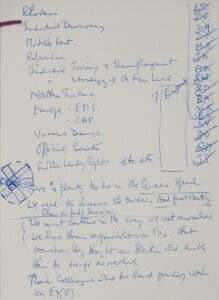 As we’ve seen from this selection of choice examples, the marginalia in the Prime Minister’s Office files held by The National Archives are fascinating as they often include comments which can be very revealing about a PM’s reactions to memoranda and letters, giving insights into their approach to the job, personal style and aspects of personality – reflecting the human side to national leaders who were often under great pressure. When you see the handwritten comments of Prime Ministers, you are connected with the person and how they are feeling at that moment in time. The public records released each year by TNA under the 30 year rule - which will, in due course, reduce to 20 years – are in paper format and are likely to continue to be so for a good many years to come; but at some point they will become predominantly digital. Will email and social media formats be as revealing as paper files when historians of the future come to appraise them? These formats will certainly offer something different. Archivists have been grappling with the challenges posed by digital records for some time now; and increasingly historians are reflecting on this matter as well. Is the pen mightiest? Only time will tell. I'm impressed by the new history available on the .Gov blog. It makes information easily accessible and is demonstrated in an educational fashion. Hats off to whom ever thought this idea up. As might be expected Clem Attlee's comments were terse. Generally he just writes 'I Agree' or even 'yes', but occasionally there is more, which can present problems to modern historians as his handwriting was truly awful. But best of all he was a compulsive doodler so researchers can sometimes find intricate doodles in his papers at The National Archives (series PREM 8). the reason that i want enjoyment, as this this web page conations actually good funny stuff too.